Assessing the health of your business. The opportunity? Think outside the box, incorporate strategy into your choices and recommendations, dig deeper only when necessary and tie in insights and opportunities with action through the category tactics. Once you've done this, the next step is to move to more advanced category analytics, including dimensionalizing business driver results from a threshold perspective and predictive analytics. How does this compare to your region and channels? And how does the Retailer / banners compare to these results? These insights can give you some perspective on the bigger picture opportunities that you can then incorporate into your tactical analysis and recommendations. Drilling through data gives you a broader perspective of your business results. Look at more than one time period (at least one long-term and one short-term period, for example “latest 52 weeks” and “latest 12 weeks”) to understand short- and long-term trends. Look across different segments based on the consumer decision tree to consider the Consumer or Shopper in your analysis. Look across different data measures to consider volumetric and share results as well as tactical results and trends. Click here to see a video on drilling through data. When completing analysis, use multiple data sources: Retailer point of sale data (syndicated market data, market gap opportunities, comparison vs market); Consumer panel data (consumer demographics, consumer purchase behavior, heavy / light buyers). We’re taught how to pull and use each data source in isolation with more of a tactical approach to the data. The opportunity is to learn how to look across data sources and incorporate insights from one source to help you make better decisions in business issues or opportunities that you are trying understand. This will take you from “good” to “great” (or even “amazing!”) in your analysis and insights. My Tip #8 below can help you with this. When using a fair share index, don’t assume it’s “good” or “bad” based on if it’s above or below 100. Think about how the index relates to the goals and objectives for the category, target Shopper and overall Retailer strategies. Click here to learn more about Fair Share Index. When using consumer purchase behavior, compare to numbers that help establish benchmarks to determine where the opportunities are. You'll only know if a penetration or share of requirements measure is “high” or “low” by comparing with other Retailers in the same category or comparing to related categories. Retailers need well-developed strategies that relate to their store formats, the tactics, Private Label and their target Shopper. They need to incorporate these overarching strategies into their category decisions, including data analysis, insights and decisions for their categories. The strategies give a Retailer the guidelines, principles and processes associated with the most important elements of their strategy. It helps your retail teams make the best decisions for their categories based on what the Retailer is trying to accomplish. The better articulated the strategies, the better and more aligned the decision making for your retail organization. understanding also helps you uncover better solutions for your brands. Don't forget the Retailer's strategy and their unique Shopper when you are completing any type of analysis for them and making fact-based recommendations. Whether you're creating an assortment analysis, doing shelving work, creating a pricing analysis or setting up promotions for next year, remember to check back to their target Shopper and overarching strategies to make sure that the recommendations you're making match well with what they're trying to accompish. 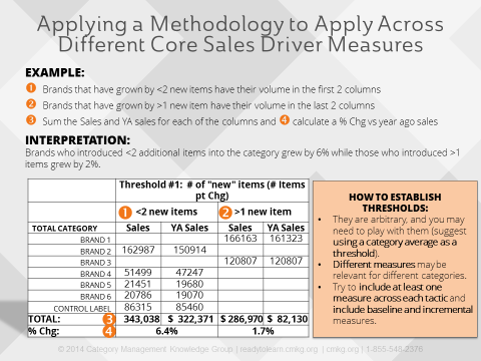 Thresholds can be applied to your analysis to give perspective on whether the business drivers we apply to our business are actually driving sales. This can be done across the tactics. For example, we can measure SKU (or item) efficiency by looking at the number of items that each brand added in this period, as well as the $ share of each item, as indicators of efficiency. Then we can bucket the results together to look from a different perspective for the # items change vs year ago. My example above includes some data measures related to product availability, or sku efficiency, for a specific Retailer. Any brands that have grown by less than 2 new items over the time period have their volume under the first two columns for this year and last year sales. Any brands that have grown by more than 1 item over the time period have their volume under the last two columns. Next, I sum the brand volume for each of the different thresholds and compare their growth. So in this example, brands who brought in less than 2 additional items into the category grew by 6%, and those who brought in 2 or more items grew by 2%. The thresholds that you assign are arbitrary – in this example, those sku’s with less than 2 or more than 1 items. You may need to play with these thresholds or use the category average as the threshold. Also, different measures may be relevant for different categories. You should include at least one measure across each of product availability, pricing and promotion, also including baseline and incremental measures. Moving to more advanced analytics also includes predictive analytics including collaborative filtering, clustering algorithms, regression models and time-to-event models to name a few. The only way you'll be successful in these more advanced approaches is making sure you keep some of the tips above in consideration. I hope that you found these tips useful! Have a great week! Looking to move to more advanced analytics? Category Management Knowledge Group can help you, your team or your organization learn more through a single course or a customized program. We have some great category management training options available to meet your needs. Check out our accredited course on Advanced Analytics: Relativity or watch a video preview of the course by clicking the graphic below.